Microtrains - the main manufacturer of ready to run Nn3 rolling stock. Republic Loco Works - the prime source of Nn3 kits and components. Lok14 - make a range of ready to run equipment for US Nn3 and European Nm. Aspenmodel - market the range of brass Nn3 models made by Westmodel. Marklin - the mother lode for loco chassis, track and other parts for Nn3. Clever Models - card kits very suitable for narrow gauge scenes, plus a range of printed textures for scratchbuilding. Roy Bergauer - supplier of N metre gauge kits and other N scale detailing parts. Nn3 is narrow gauge in N scale, primarily, but not exclusively using Z scale standards to represent 3ft narrow gauge railroads.While it's obviously a minority interest, it's followed by an increasing number of modellers worldwide. Over 400 photos and diagrams, 140 information packed pages. See some sample pages: Contents, Foreword, Locomotives and Trackwork. If you do not live in the US, using the Web will most likely save you money since this way you will be charged only for the actual cost of shipping (and not the estimated cost). US and Territories: Enclose a check or Money Order of $31.50 to cover product($25) and shipping($6.50). Canada: Enclose a check or Money Order for $33.50 (US currency) to cover product($25) and shipping($8.50). Rest of World: Enclose a check or Money Order of $40.50(US currency) to cover product($25) and shipping($15.50). 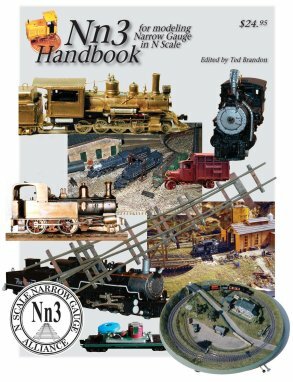 For further reading, the Nn3 Manual and Narrow Gauge Data Book, both published by NTRAK are also recommended. Recommended magazines are Light Iron Digest, Narrow Gauge & Shortline Gazette (US), Voie Libre (France) in French with an English translation leaflet available on request and Narrow Gauge & Industrial Railway Modelling Review (UK) published by Greystar Publications.